Mary and Hilary Evans spent more than fifty years collecting the material that now comprises the library and we’re often asked by visitors what proportion of the analogue archive has actually been scanned. A finger in the wind guesstimate might find us suggesting 15-20%, but the truthful answer to this is we don’t really know. But what we do know is that it is still possible to unearth incredible treasures containing images that have never made it near a scanner. While it’s frustrating to find ‘perfect’ pictures hidden away, the fact that we are still lucky enough to experience that sharp thrill of discovery more than compensates. A case in point is a photo album recently discovered neatly filed and catalogued along with others, but apparently untouched for some years. The stained, green binding was fairly unpromising but inside is a superb collection of photographs dating from the late 1890s to the 1930s. 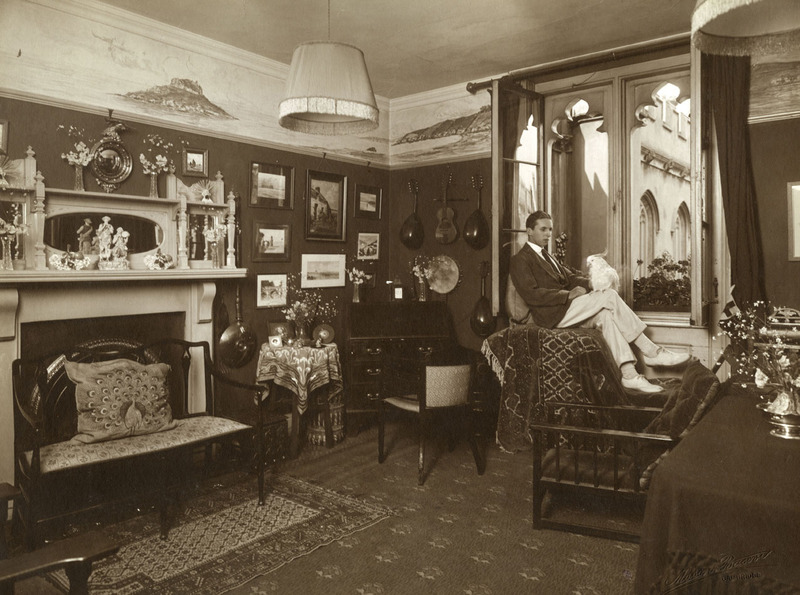 The picture that particularly caught our eye at first was the interior of a Cambridge student’s room in 1911. Written above it in ink were the words, ‘My rooms. K. 5. New Court Trinity College Cambridge. 1911’. It may be Cambridge but even so, the room itself is unlike any student digs we might imagine today. Ornaments are neatly arranged on the mantelpiece of a large fireplace, the walls are adorned with landscapes, and a collection of ukuleles and lutes. Above the picture rail what looks like a hand painted border shows a maritime landscape that includes St. Michael’s Mount. A small occasional table is draped with an art nouveau style tablecloth on which are placed framed photographs, presumably of family members. An elegant seat is enhanced by a rather beautiful looking peacock cushion, and the inhabitant of the room sits in the window, a pet cockatoo perched placidly on his knee. Further investigation soon confirmed that the album belonged to a ‘C. Grasemann’, the student in the picture. He features in most of the album’s other photographs which neatly chart his life and career from boy to man in a series of evocative images, many of which are excellent quality, printed in a generous 10” x 8” format. 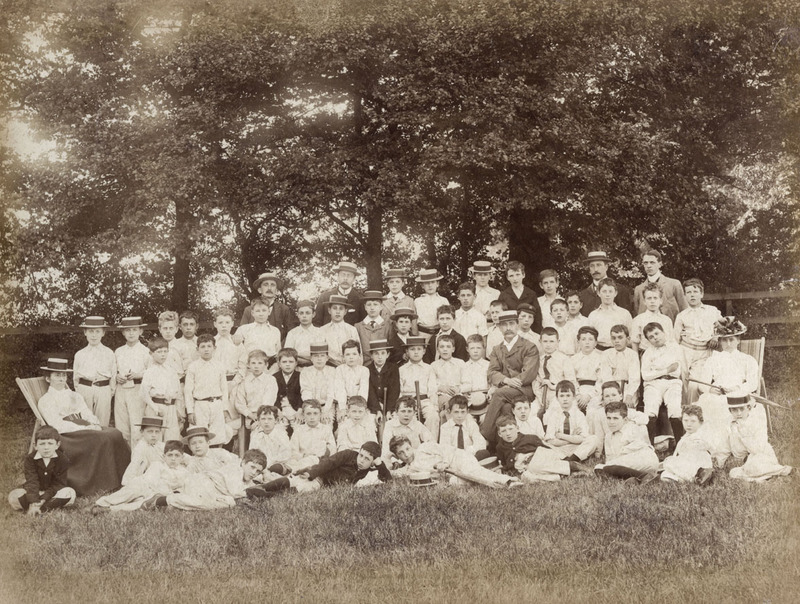 The earliest picture, from 1899, is a group photograph from Fretherne House School (a prep school in Welwyn Garden City up until the Second World War). Two more of Fretherne House take us up to 1904 as which point C. Grasemann became a pupil at Rugby School. Another photograph shows him cross-legged in the front row of W. N. Wilson’s House. Every boy is annotated in miniscule, spidery writing. At Rugby, he was in the OTC band, playing the tenor horn by the looks of one photograph. He was also in the school orchestra and when he went up to Cambridge, became a rower, a sport well-documented in the album. Not only are there pictures of Grasemann’s rowing crew in action, but there are some beautiful views of Henley Regatta around 1911. Together with photographs of college balls, society dinners, winter sports and a fancy dress party in Switzerland (even one of the famous skating couple Mr and Mrs Edgar Syers) these are images that take us back to that extraordinary pre-war era when a young man of Grasemann’s fortunate circumstances would have had the world at his feet. Except the world was about to slide towards catastrophe. Grasemann’s war saw him gazetted on 10 June 1915, joining the Royal Engineers as a Lieutenant. 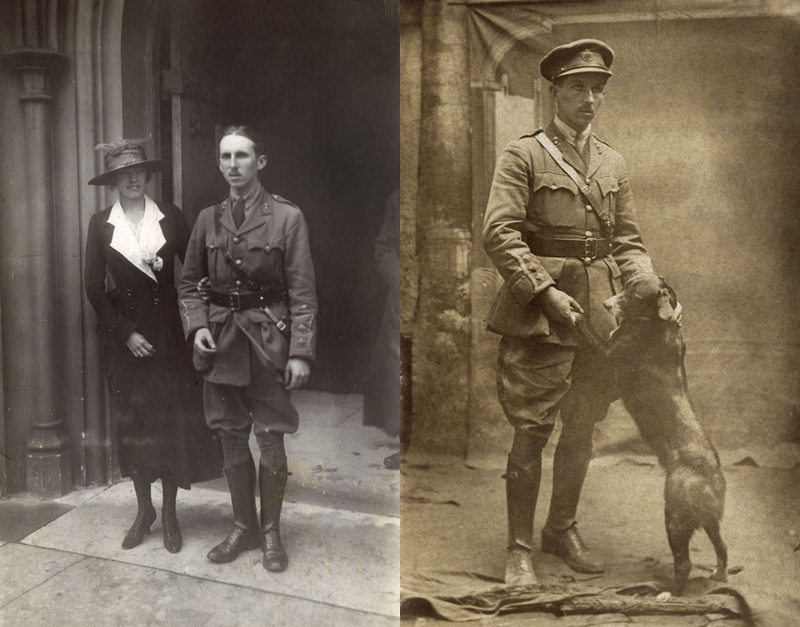 The only wartime pictures in the album are a couple of his marriage to Irene Statham on 19 September 1916, while another photograph of him in uniform with a friendly dog arrived with the message, ‘As we can’t come we send our photo’. All leave had been cancelled. Keen to find out more about who C. Grasemann was, some internet sleuthing revealed he was Cuthbert Grasemann (1890-1962) who after the war became the Public Relations and Publicity Officer for British Railways (Southern Region). Armed with this knowledge, some of the later photographs begin to make sense – one charming photograph of the South East and Chatham Railway Travelling Ticket Inspectors Garden Allotment Prize Giving in Catford in July 1922 for instance, or an annual dinner given to staff of the Superintendent of the SE & C Railway. 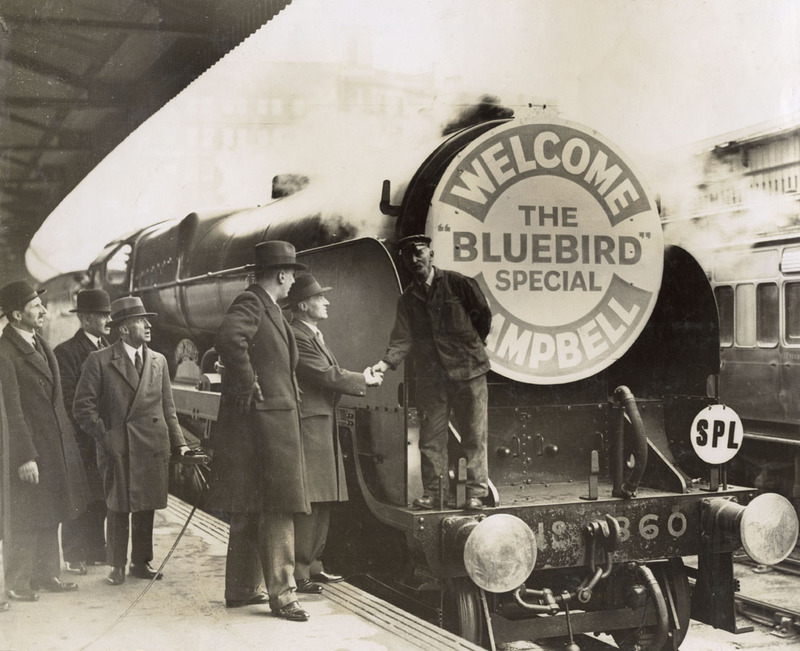 Another shows him accompanying Sir Malcolm Campbell as he meets the driver of the Bluebird steam train emblazoned on the front with ‘Welcome Campbell’ (presumably this coincides with one of Campbell’s land speed records in the Bluebird – possibly in 1927). One gathering from 1925, an annual reunion dinner of the Railway Operating Division of the Royal Engineers, indicates how he progressed along his particular career path. He was also the author of two books, ‘English Channel Packet Boats’ in 1939, and ‘Round the Southern Railways Fleet’ in 1946; clearly his job overlapped happily with an enduring personal interest in transport. Even without the detective work to uncover his personal story, the photographs in Cuthbert’s Grasemann’s album are a haunting and redolent memento of a lost era. Turning the pages, L. P. Hartley’s opening lines of ‘The Go-Between’, ‘the past is another country’ spring to mind. Especially in the case of the early photographs, this is pre-war Britain as it once was for a privileged few. One can’t help wondering about the fates of so many of the boys and men in those photographs. Who made it through the war, and who didn’t. But there is one more thing that makes this album doubly interesting. 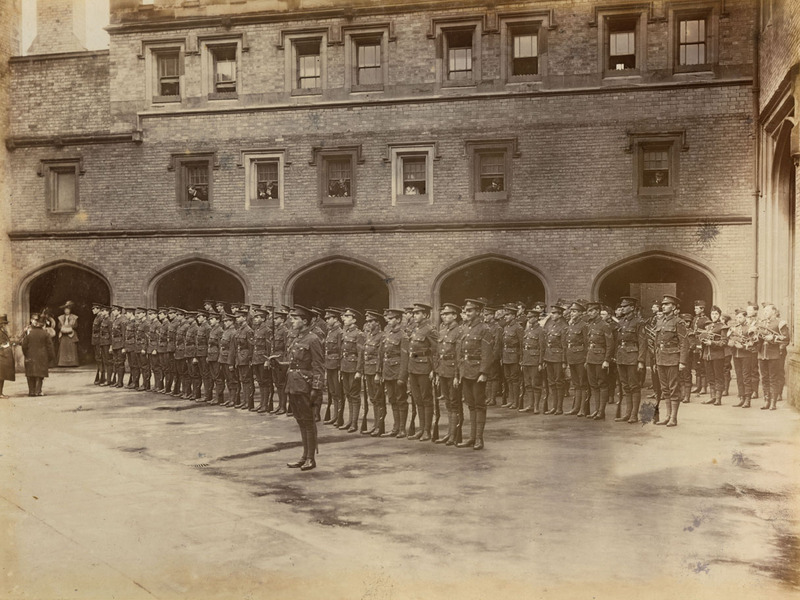 Two photographs document a visit to Rugby School by Lord Roberts on 16 February 1906 where he inspected the Rifle Club, an early version of the school’s Officer Training Corps. 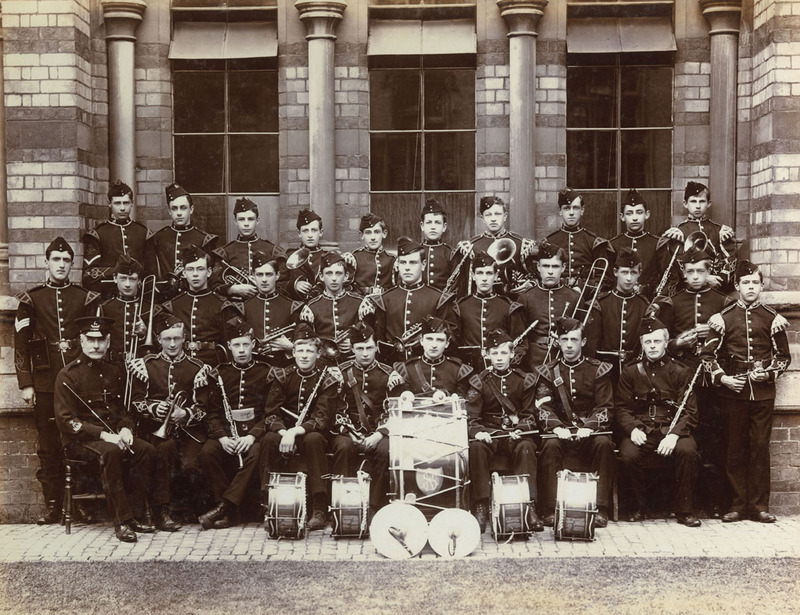 Cuthbert Grasemann, who would have been 15 or 16 at the time, can be seen in his bandsman’s uniform standing in line near the back. 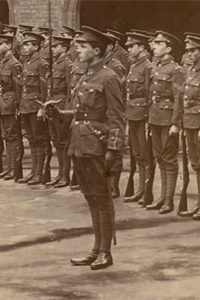 In charge of the corps, standing at the front is one 2nd Lt Rupert Brooke. Brooke is one of Rugby School’s most famous alumni. His father was a housemaster there, and at the time of Lord Roberts’ visit he would have been 18. 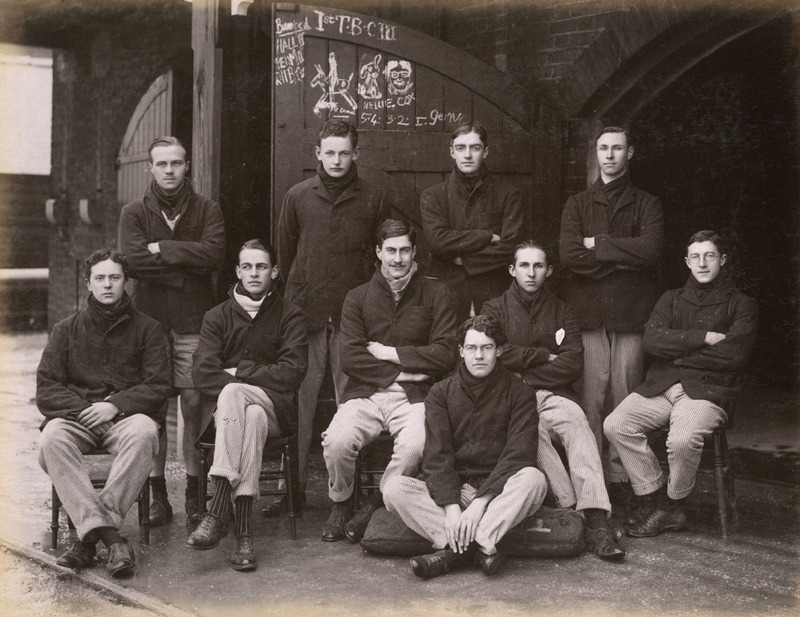 Academically gifted, sporty, and with renowned good looks, he would go up to Cambridge in autumn of that year, having won a scholarship to King’s College. One of the most famous of the Great War poets, the tragedy of Rupert Brooke’s death, from an infected mosquito bite on a French hospital ship in the Aegean Sea off the coast of Skyros on 23 April 1915 caught the public imagination. Shortly after his death, his poetry collection, ‘1914 and other Poems’ sold 160,000 copies. With three years separating them, it is unlikely Grasemann was on very close terms with Brooke, but it is clear that he was aware of his significance. Underneath the photograph in which Brooke’s handsome profile is unmistakable, Cuthbert Grasemann has unusually included Brooke’s Christian name in his annotations. It is probable this album was compiled a number of years after Brooke’s death by which time his name had entered into Great War mythology; a fallen warrior, a ‘young Apollo, golden haired’ as described by the poet Frances Cornford. Did Mary and Hilary ever notice Brooke’s existence among these photographs? The fact that the entire album has never been catalogued or scanned suggests not; a natural oversight in a collection that numbers thousands and thousands of individual items. Only on closer examination did I myself notice the picture and it is finds like this that make Mary Evans such a unique place to work. How they acquired the album in the first place is unknown. Papers relating to Cuthbert Grasemann are held at the National Archives and the National Maritime Museum. It seems strange that this album of such exquisite personal photographs should have been sold. A small pencil inscription on the inside front cover suggests it was bought for £20 – quite possibly some years ago. Whatever was paid for it, we believe the contents are simply priceless. All images copyright © Mary Evans Picture Library. Please contact Mary Evans Picture Library is you would like permission to reproduce any of our pictures.